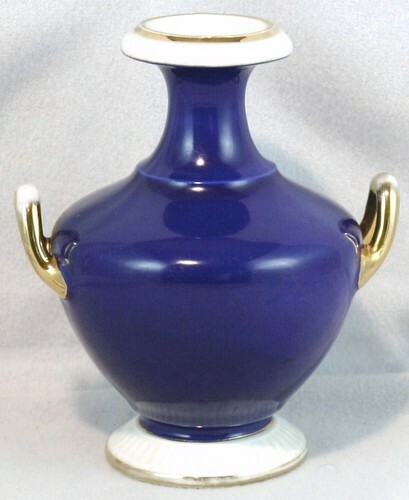 Vintage Furstenberg posey vase. It's cobalt blue and white with gold handles and trim. The mark dates it to 1906-1918. The vase is about 5 inches high by 4 1/2 inches at the widest point with a 1/2 inch opening. There's some wear on the gold trim consistent with its age, but otherwise excellent condition. The factory at Fürstenberg was founded in 1747 under the Duke of Braunschweig but no porcelain was made until after 1753. Their most productive period was from 1770 to 1790 with a paste that was yellowish/greyish. The mark used was some form of the letter F in the 18th and 19th century and an F under a crown in the 20th century. Unlike many of the other smaller makers, Fuerstenberg is still around today.